The Gulf of Chiriqui is a pristine Pacific Gulf nestled into Panama’s northwest side. Known to some as “the lost coast,” Chiriqui is a destination just waiting to be discovered by the world at large. The unspoiled coastal and marine environments in the area rival the best on the Pacific coasts of Central America and Mexico. Dozens of pristine emerald isles dot the Gulf, encompassing some of the world’s most bio diverse ecosystems; dense jungles and primordial mangroves boast thousands of species of flora and fauna. An extraordinary amount of marine species call these temperate waters their home, including humpback whales, hammerhead sharks, dolphins, multiple species of sea turtles and giant rays. 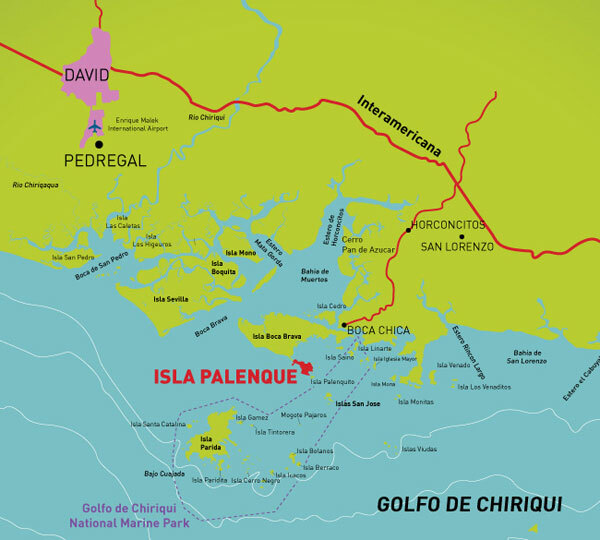 International Living calls Panama real estate the best place to shelter your wealth from today’s economic chaos, and the Gulf of Chiriqui is an uncrowded paradise with available island properties within an hour of the David airport. Experience world class sport fishing opportunities at Hannibal Bank, surf a twenty foot swell off of Moro Negrito, watch humpback whales breach, scuba dive or snorkel in the protected waters of the Coiba National Park, or live in a Panama vacation home on a luxury eco resort. For those who seek adrenaline pumping adventure and those looking to escape it all, there is something for everyone in the Gulf of Chiriqui. Book your trip today for the journey of a lifetime.